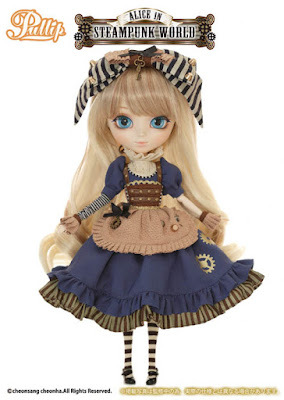 New for summer 2015 from Groove: Alice in Steampunk World. 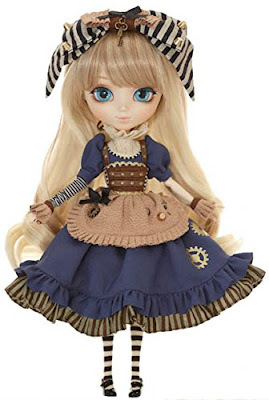 This Pullip doll wears a blue dress, striped underskirt, striped stockings, has gears on her dress, a tiny corset, and a bow on her head. So darling! She's also available on eBay. The Mad Hatter in Steampunk World is a girl! She wears a big bow in her hair, with a gear on it; a gingham dress with striped underskirt; a leather-look corset with straps; and platform boots. 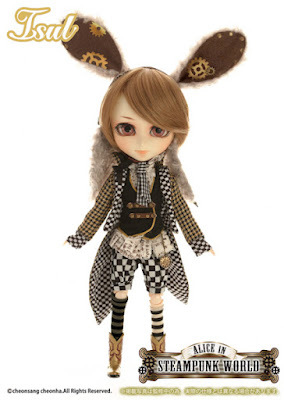 The White Rabbit in Steampunkland will be an Isul, due to arrive August 2015.